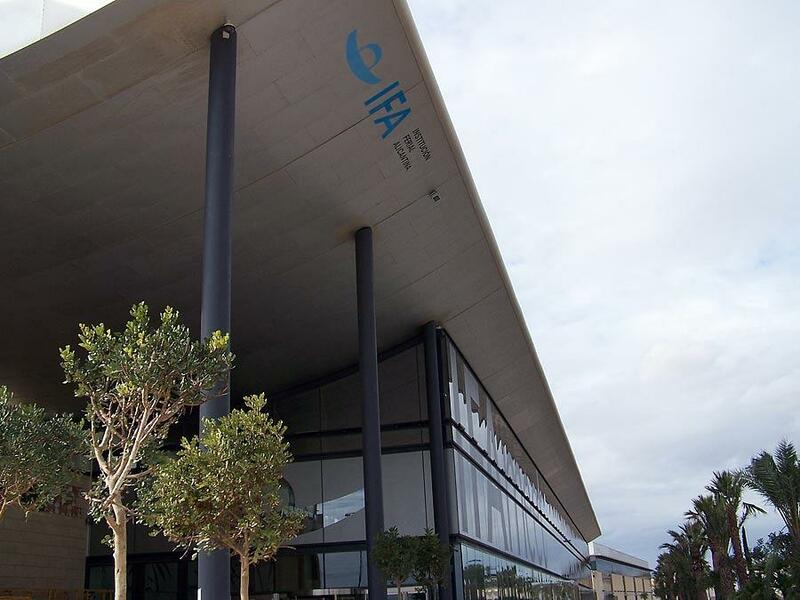 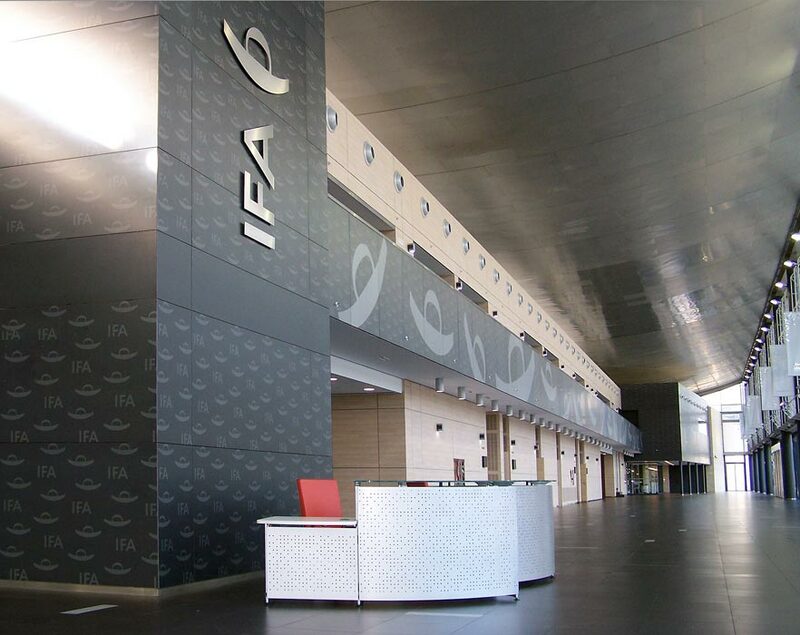 The IFA exhibition centre, opened its first expansion phase of its installations. 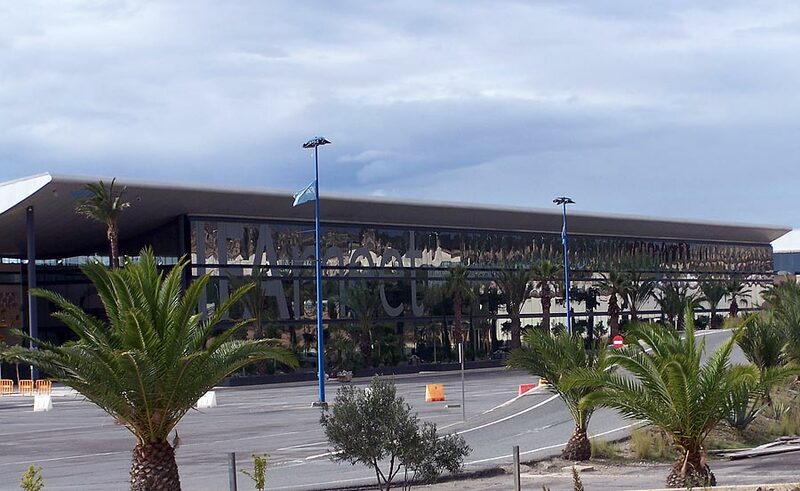 The refurbishment is accessed via Pavillion 1, and represents an investment of 4.9 million euros. 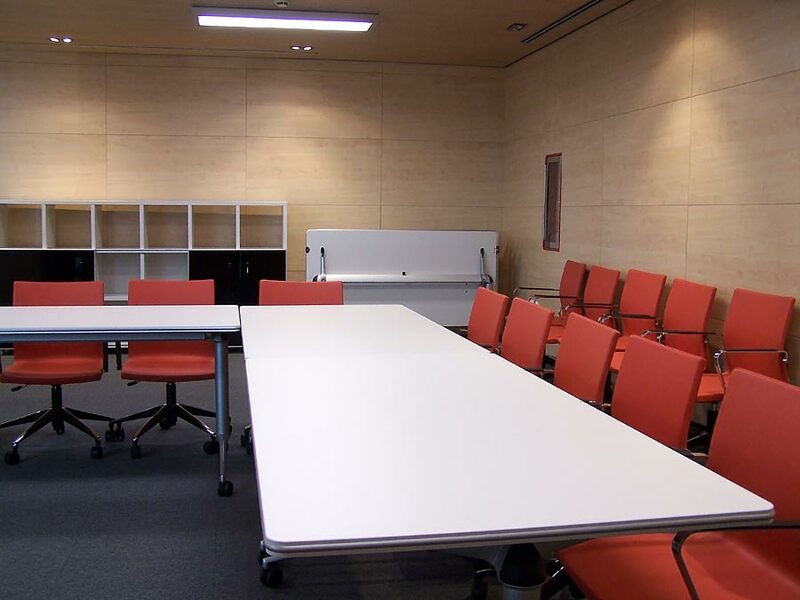 The site now has 11 new rooms equipped with the latest technological advances to host conferences and seminars. The new offices have a capacity of between 20 and 220 people and have translation booths, video production, plasma screens and audiovisual control booths. 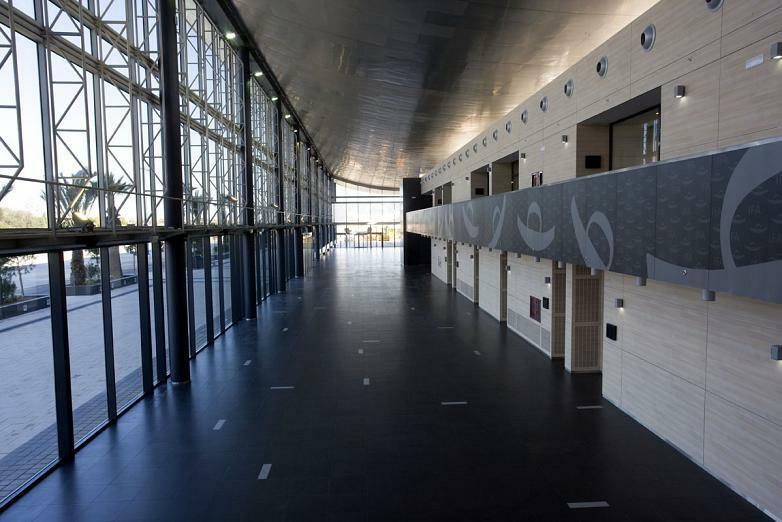 In the central part of the new space is the Ágora, a spacious area for the celebration of trade fairs and conventions which can hold up to 1000 people. 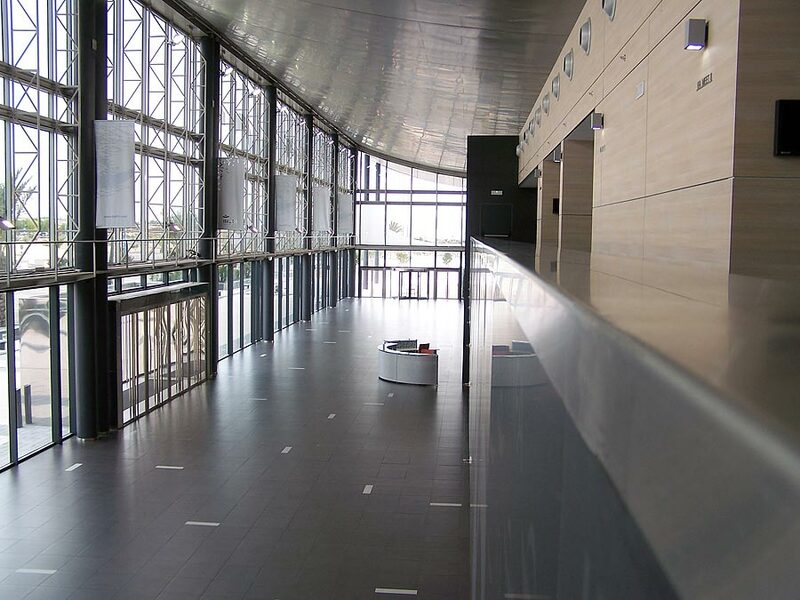 It is one of the most modern exhibition centres in Europe, for its versatility and it acts as a benchmark at international level which places it amongst the ten leading European exhibition centres for its size and diversity of uses. 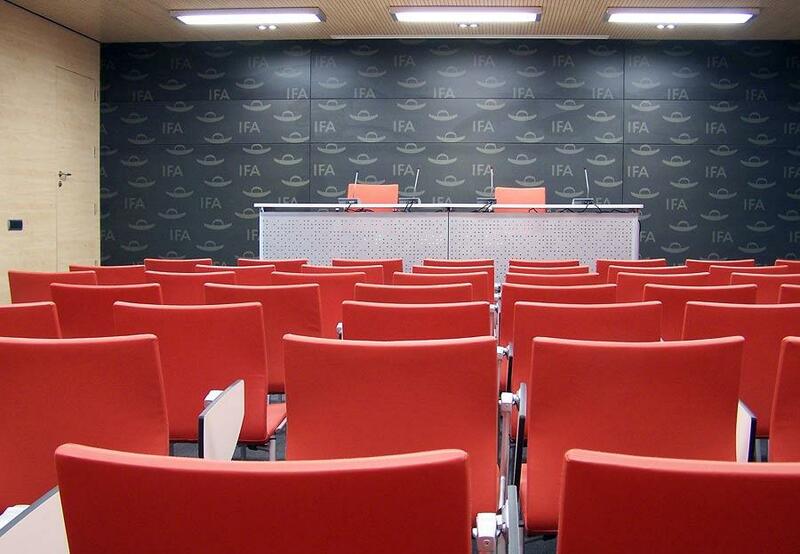 Recently it has been known as the best venue for conferences in Spain. The furniture used carries the Actiu stamp. In the entrance hall and reception area several customer service counters have been used from the Informa model. 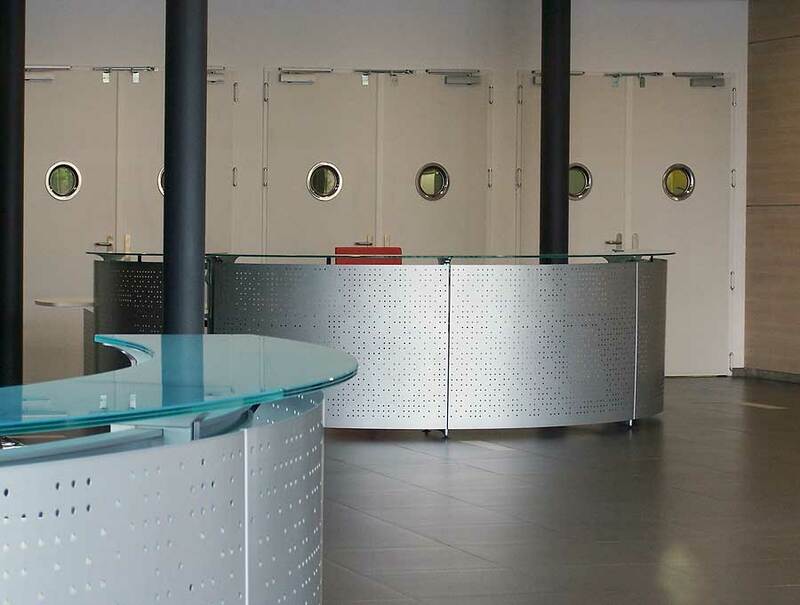 With an avant-garde design combined in metal and glass, they integrate perfectly with the environment with the same materials. 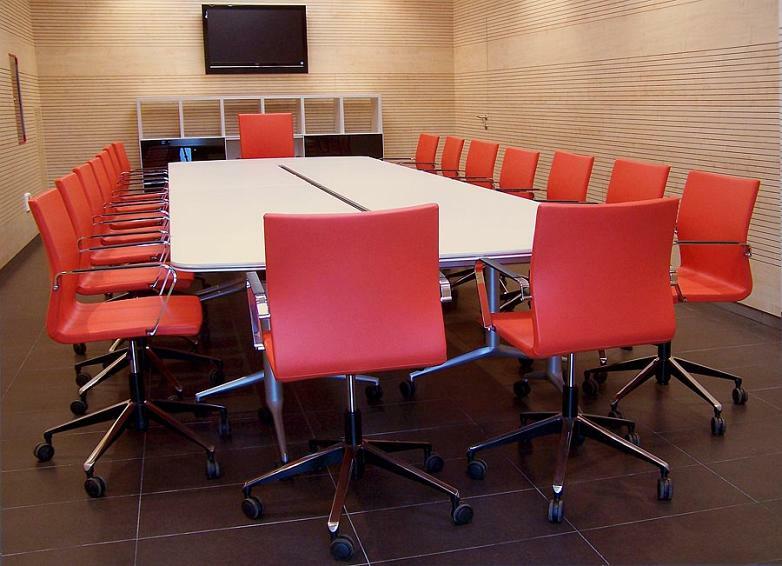 The composition is finished with the managerial chair Kados, upholstered in red. 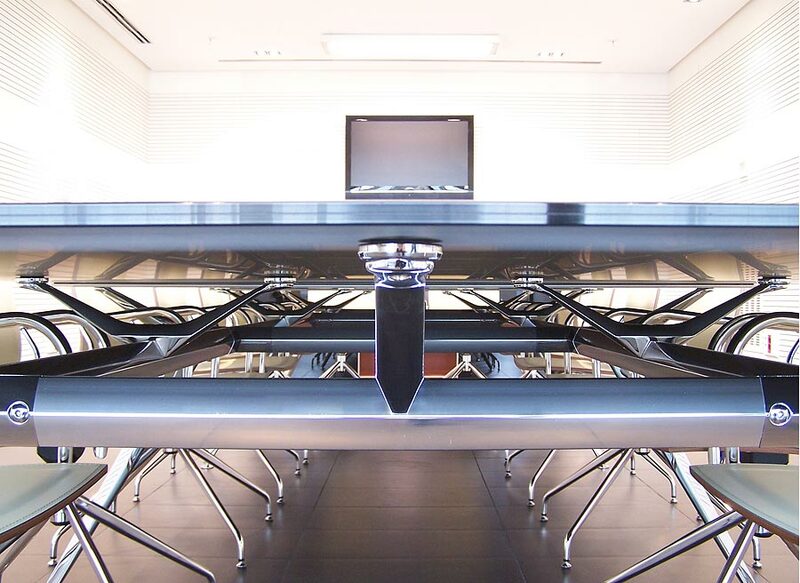 In the meeting rooms the Arkitek desk has been used, with a striking chrome structure and surface in black glass. 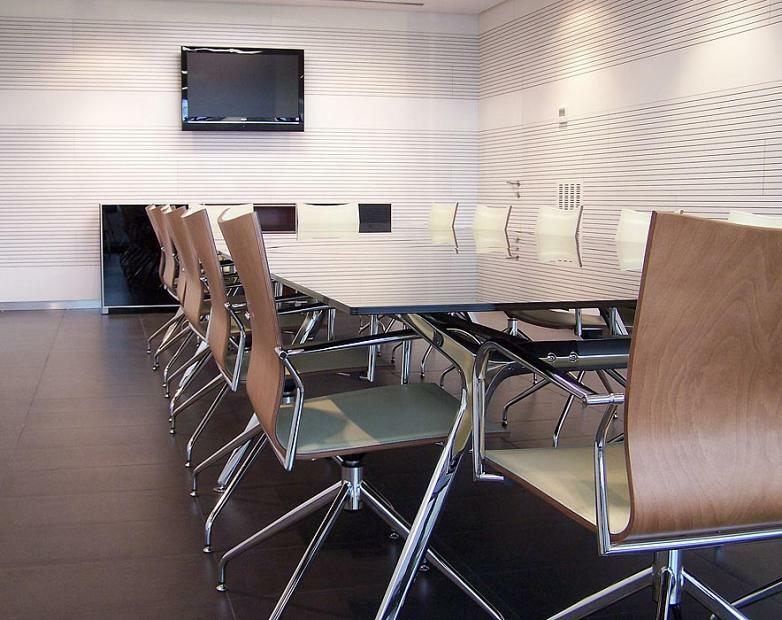 The elegant Ikara chair accompanies it, with clean, slim lines finished in a lacquered wood and with an interior upholstery in cream. 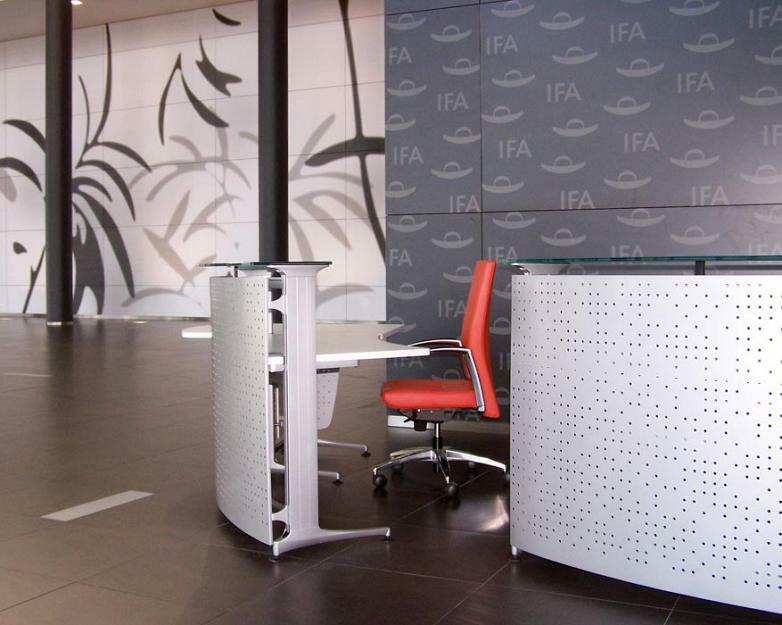 Exclusive furniture with a selected visual presence. 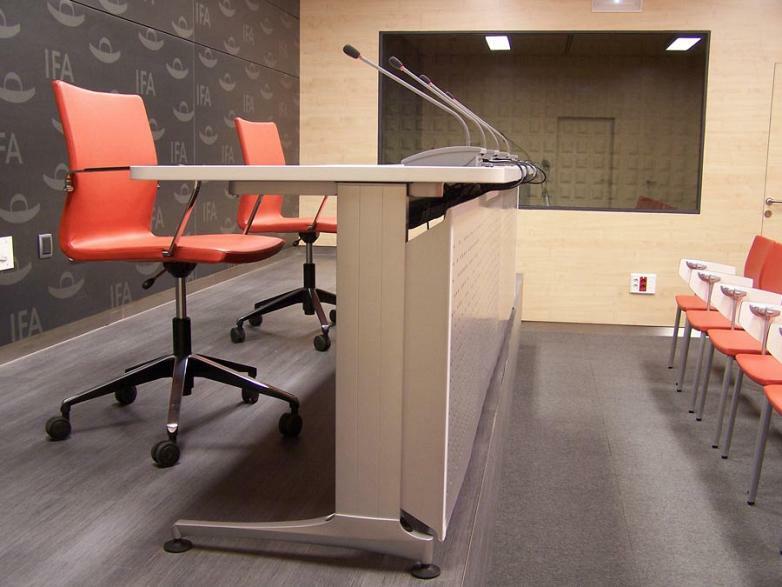 The auditorium shows us other possibilities from the Informa program, in this case adapted for conference desks, with an integrated electrification system for microphones. The Uma chair, with gas elevation, castors and armrests is present on the platform which sets the stage. 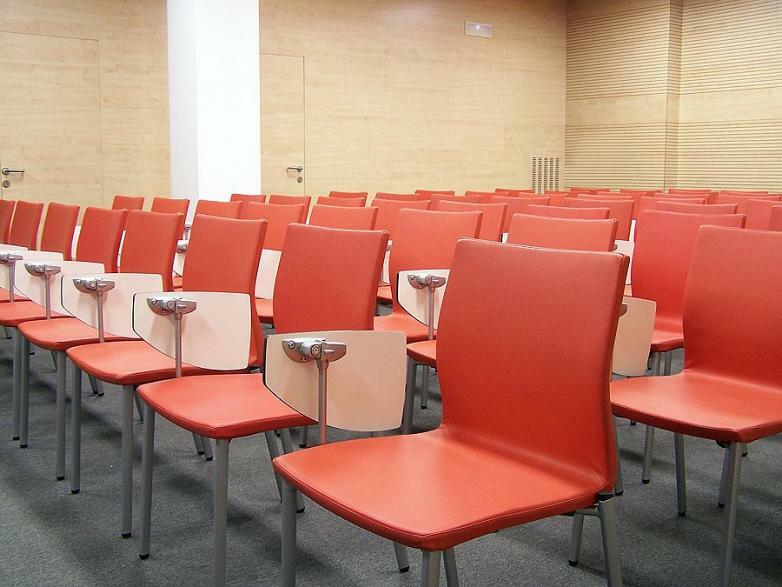 Meanwhile the version of Uma with legs and a writing tablet in phenolic, offers maximum ergonomic and functional features to the attending public. 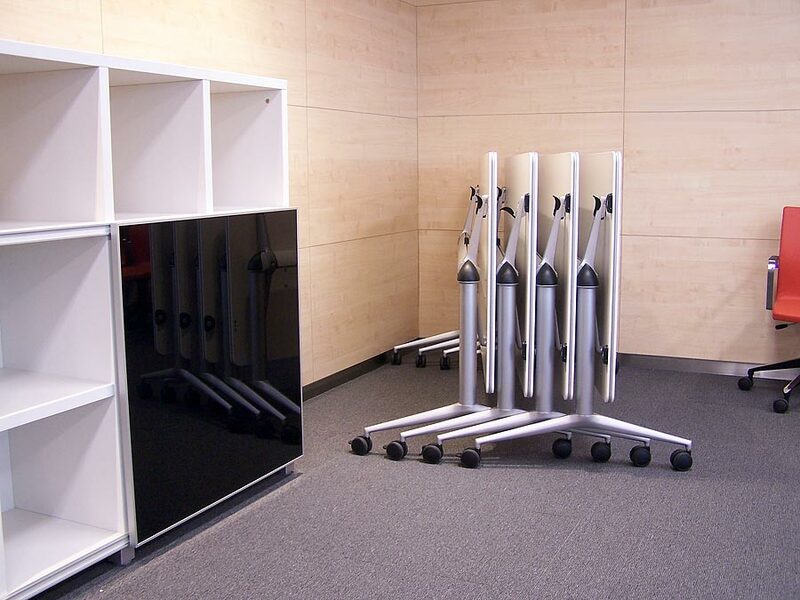 In the training classrooms a multi-purpose desk has been used which offers mobility around the room without the equipment conditioning the distribution. 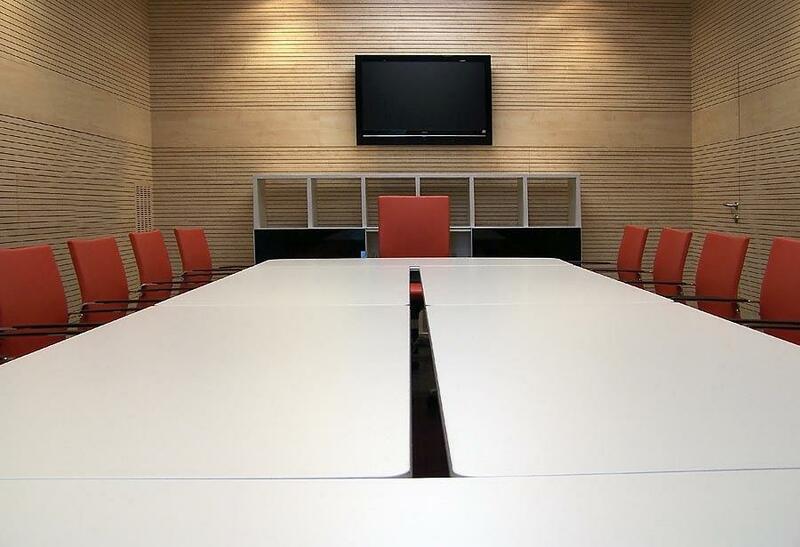 The furniture should fit the needs of the room and not viceversa. Trama is the solution. 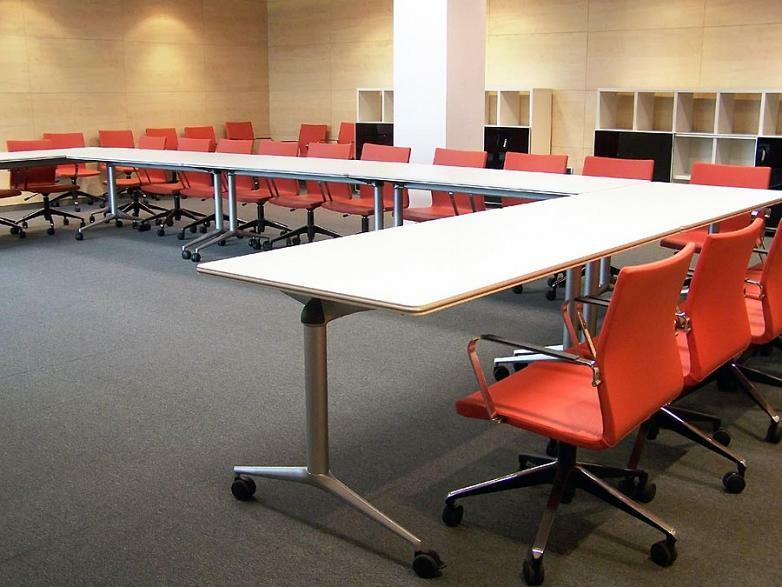 A foldable desk with castors, with a simple and versatile design, which guarantees maximum mobility and creates multiple configurations depending on the activity being performed or the number of attendees. 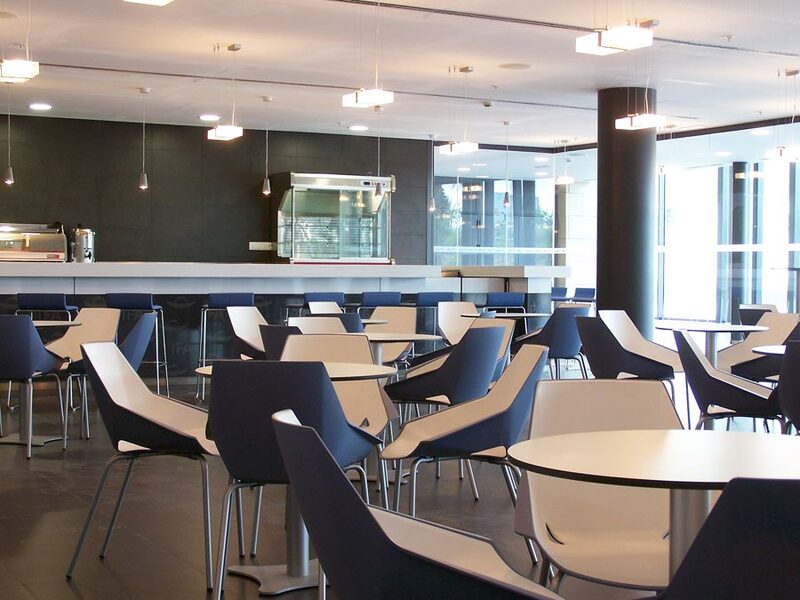 The seating has been given continuity by choosing Uma for these spaces. 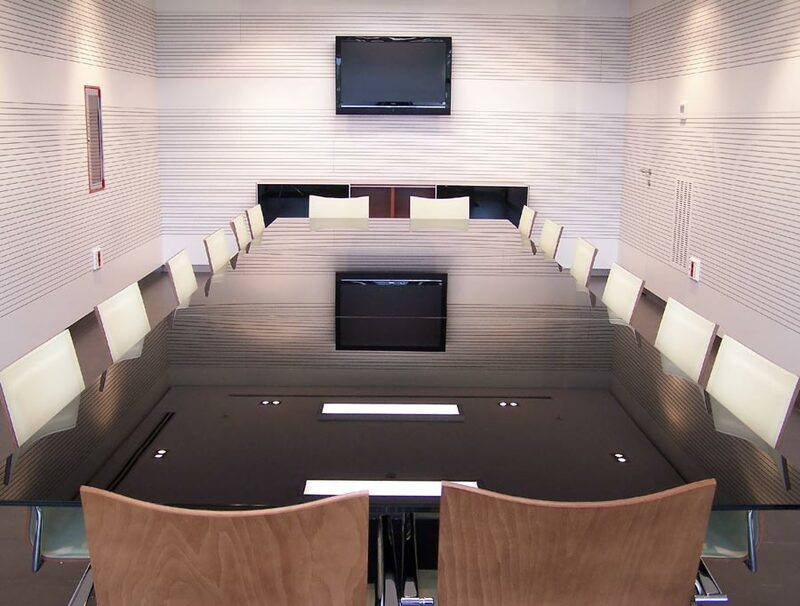 Cubic has provided, with modern aesthetics, the filing solution for the different rooms, meeting rooms, training classrooms etc. 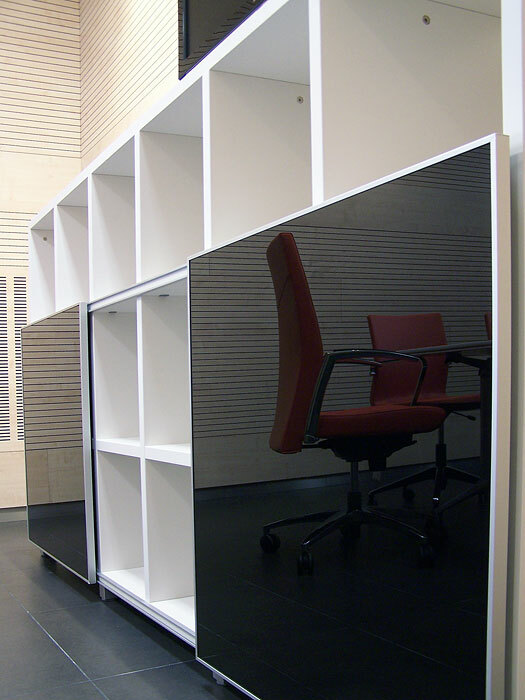 Some parts of the shelving is closed with sliding doors in black security glass and with an aluminium frame. 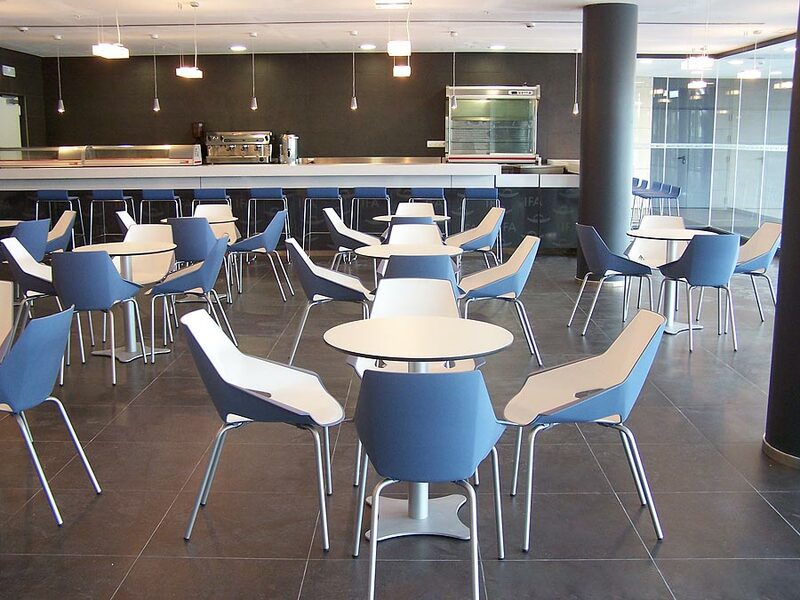 The freshness and colour scheme were the premises than marked the selection of the furniture for the cafe. The result; the Viva chair with a blue housing and a white cushion, complemented with round Canteen tables. 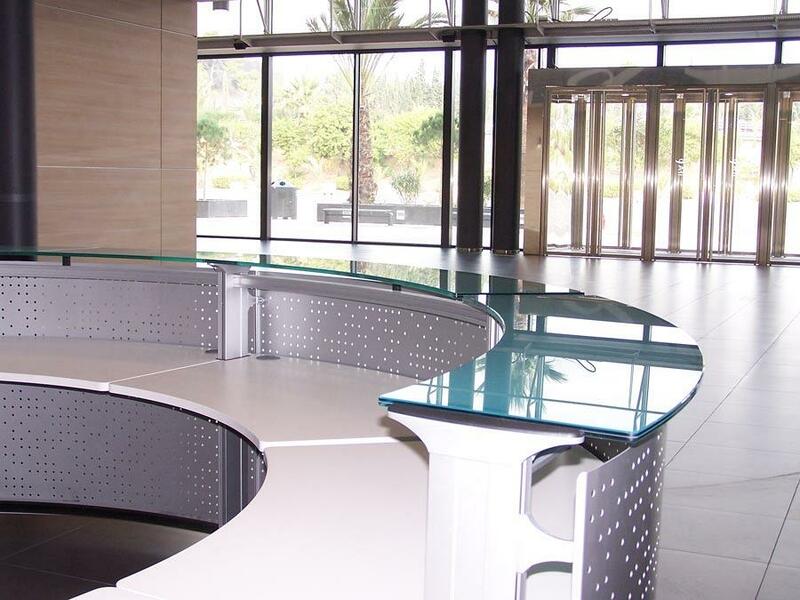 A very practical configuration designed for intensive use.